Pevsner wrote of this church (shown left, from the southeast), "Most of the architectural evidence points to a later fourteenth century date", which is probably right, but some features nevertheless show a close similarity to others at nearby St. Michael's, North Cadbury, which was built c. 1423, and the important woodwork inside is probably late fifteenth century in date, including the nave roof which, though essentially a finer version of the roof at North Cadbury, displays Tudor roses on the tie beams. 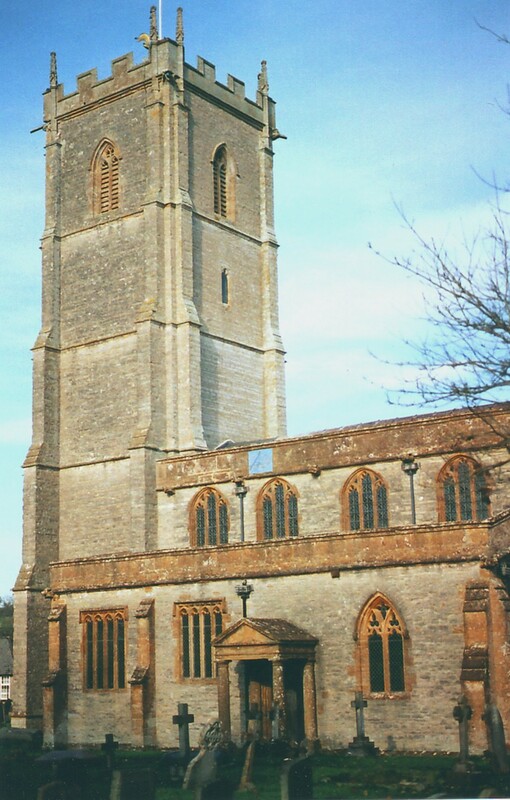 The building consists of a chancel with a N. chapel, an aisled nave with a little eighteenth century S. porch and a rood stair turret topped by a pyramidal cap in the re-entrant between the chancel and S. aisle, and a W. tower with a northwest stair turret. The N. and S. windows to the chancel, each formed of three ogee-arched lights with alternate tracery and subreticulation, and sublights trefoil-cusped at top and bottom, rather give the appearance of having been inserted later into earlier walls, and the squat window in the N. chapel may be further evidence of this for it certainly seems to require a taller opening: it is transomed like the tall E. window to the chancel, but whereas a transom makes good structural sense where it can serve its proper purpose of holding long mullions firm, it is quite superfluous here. The aisle windows, except for a two-light one to the east of the S. porch, are four-light and square-headed, with the merest suggestion of supermullioned tracery above. The clerestory consists of four pairs of untraceried three-light windows with stepped lights separated by strong mullions. The tower rises in five stages supported by set-back buttresses, to two-light reticulated bell-openings and a pair of crocketed pinnacles at each corner, sitting on the final set-offs of the buttresses. The stair turret projects higher than the tower and, like the tower itself, is embattled, whereas all other rooflines end in plain parapets. The three-light W. window to the tower has alternate tracery with subreticulation and an ogee-arched niche above, and the W. doorway is two-centred and surrounded by continuous sunk quadrant mouldings. This could be of significance: the employment of sunk quadrant mouldings, where it can be firmly dated in East Anglia, seems most commonly to occur in the late fourteenth century (see Appendix 2), but they were used in this county, at nearby North Cadbury, apparently around 1420, and they are also encountered at St. Mary's, Chard, some twenty miles to the southwest, where the work is ascribed to the years 1400-1440. Finally, in this external description of St. Barnabas's, the Georgian S. porch with open sides (illustrated right) is a curious addition, consisting of a plain pedimented cap supported on four Tuscan columns. Inside the church, the four-bay nave arcades are formed of two parts, a distinction unremarked on by Pevsner, who described them as "hardly later than c.1360", or by Kenneth Wickham in his book Churches of Somerset (Phoenix House Ltd., 1952), who merely said "Decorated". In fact, though all the piers are octagonal and equally short and broad, the three eastern bays of the S. arcade carry two hollow chamfers round the arches, while the remaining, slightly narrower, arch to the west and the whole of the N. arcade, (shown left) bear two sunk quadrant mouldings. This might suggest the three eastern bays of the S. arcade were actually constructed first - perhaps, indeed, in Decorated times (which might tie in with the two-light window in the S. aisle) - and that a decision was only made afterwards (perhaps a few decades afterwards) to extend the aisle to the west and add the N. aisle opposite. The capitals, admittedly, do nothing to advance this argument, for the S. arcade capitals and the two western ones to the north, are all plain, while the three easternmost capitals to the north are decorated with leaf carving. 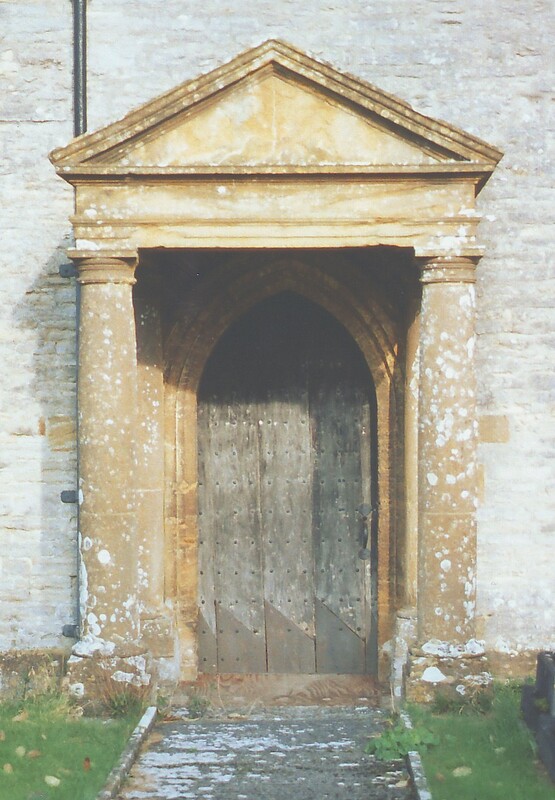 However, the tower arch appears to conform with the N. arcade and W. arch of the S. arcade in style, so perhaps a belated decision to erect this together with the N. aisle and extension of the nave and S. aisle, gave rise to a difficulty in the setting out the building that was responsible for the narrower western bay. Be that as it may, above the arch, facing into the nave, the gable line of the former nave roof can be seen, which was obviously contemporary with the tower. The clerestory and tall, deep chancel arch with soffits panelled in five tiers, both appear to be late fifteenth century work and of similar age to the more important surviving woodwork, meaning the roofs, rood screen and pulpit. 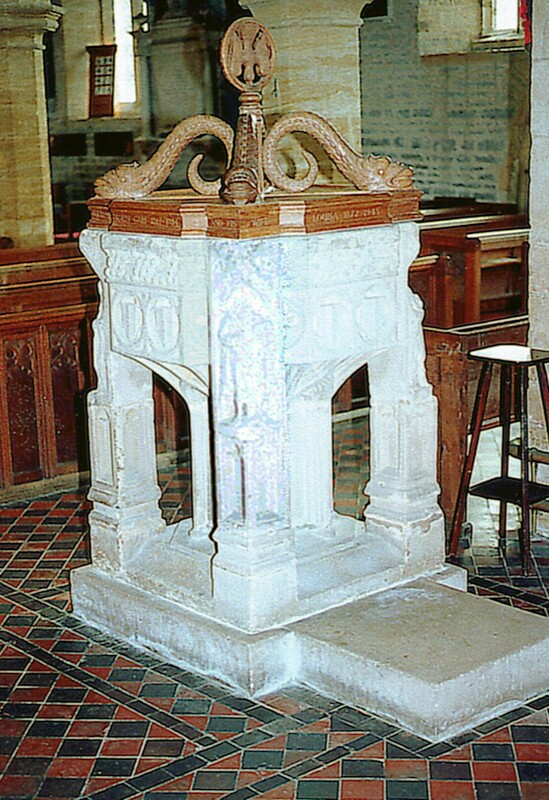 However, before considering this, the unusual font should first be noticed (see the photograph, right): the bowl, as usual, is octagonal, but it is supported against the ordinal faces by large carved supports bearing four damaged figures. 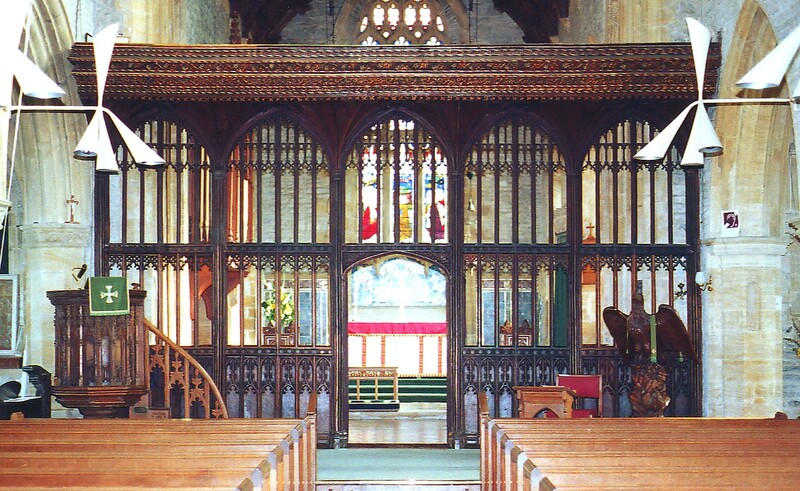 Carpentry, nevertheless, is much more impressive in this building, and the rood screen (shown above) is an excellent piece of work, composed of five, six-light transomed sections, with blank tracery on the dado and, at the top, supermullioned tracery between strong mullions, supertransoms across the four middle lights, and a spectacular fan-vaulted loft with four bands of carved decoration on the cornice. The pulpit is another fine piece of work, featuring nine canopied niches, and the chancel roof of wagon construction, displays many carved bosses, including angels and animals from the mediaeval bestiary. 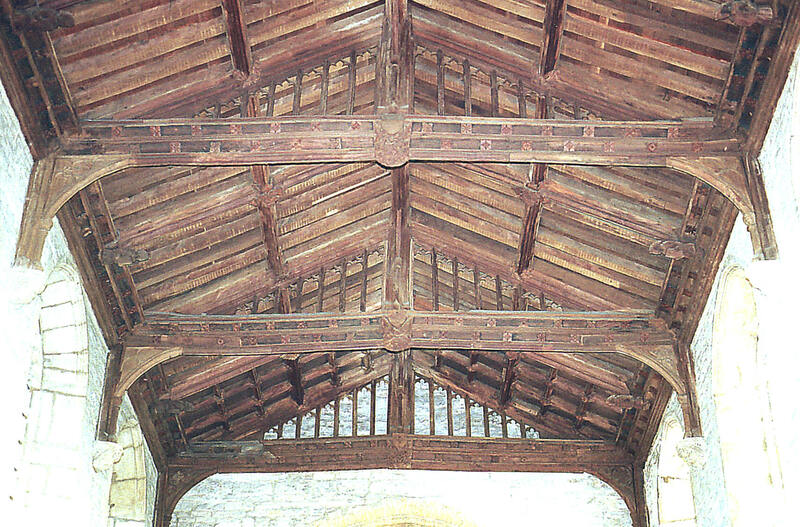 Finally, the nave roof (illustrated below), already referred to, is of king-post type and relatively shallow-pitched, with tie beams decorated by Tudor roses and small arched braces below, rising from carved stone corbels. 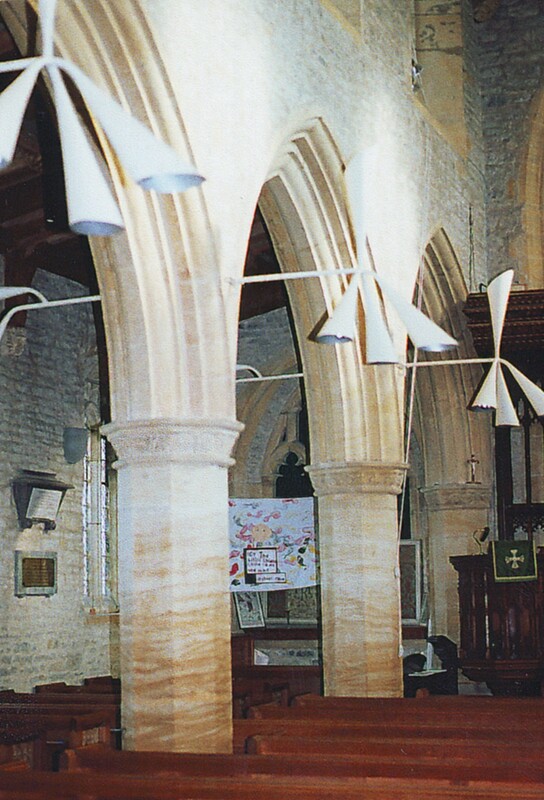 The intermediate principal rafters are decorated by angels, and the spandrels above the tie beams are filled with simple tracery formed of trefoil-cusped arches set between strong mullions.